I love to make things. Mostly I sew, but sometimes I like to take a break from fabric and make jewelry. 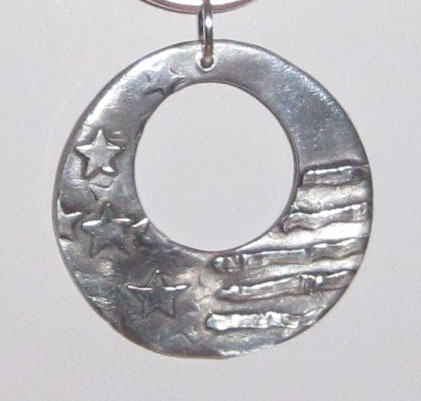 A little while ago, a friend of mine asked me to create a special necklace to celebrate a big day — his wife was scheduled to take the oath of U.S. citizenship. Today’s the big day for his wife and I thought I’d share the necklace I made to commemorate the occasion. We agreed that it would be nice to have a pendant or focal point for the necklace, and so he went looking for the perfect piece. We wanted to find something appropriate for the day that his wife could wear year round. He found it when a Google search landed him on Kellee Bostic’s webpage: http://artseekraftsee.artfire.com. This lovely piece has stars and stripes, but I think it’s subtle. The pendant is made of PMC (precious metal clay) and is .999 silver. Very pure. And a perfect starting point for this necklace. My friends at Eminence Jewelers in Fairfax, VA engraved the date on the back. The client wanted to evoke a patriotic spirit but we agreed that we didn’t want the piece to scream red, white, and blue. Once I had the pendant in hand, blue became the obvious choice. After a little searching, I found these lovely resin teardrop beads in a faded denim blue. I added blue seed beads and then began to play with the sterling components I have collected. 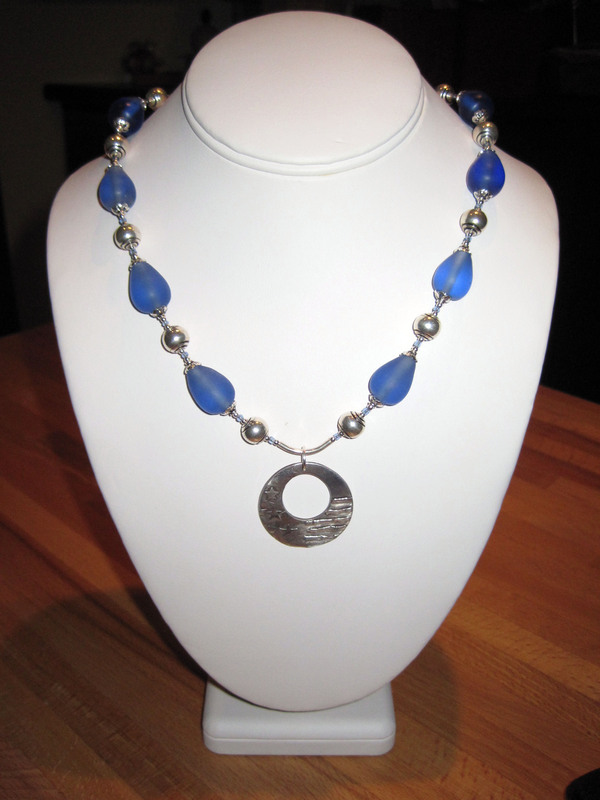 The closure is a lovely moonstone and sterling box clasp from Star’s beads in Vienna, VA. I wish my client and his wife all the best! Congratulations! It’s a big day.